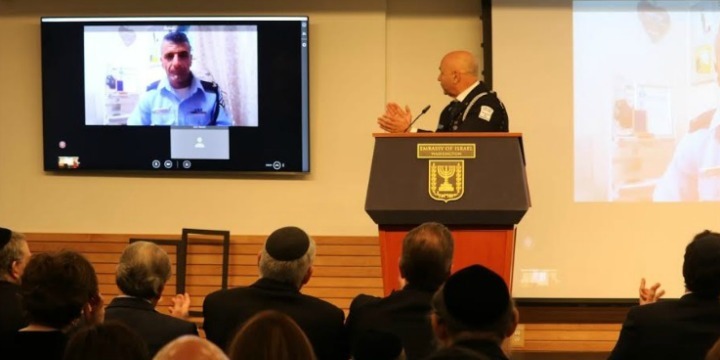 Two American men were honored at a ceremony at the Israeli Embassy in Washington, DC, on Thursday for the aid they provided to a police officer during a May 2017 terrorist attack in Jerusalem. After praying at the Western Wall in the Old City, Simche Czin and Mordechai Lichtenstadter — both Jewish residents of Brooklyn’s Borough Park neighborhood — came upon an assailant stabbing policeman Naaman Fares. Lichtenstadter jumped into action, pulling the terrorist off of Fares, who, despite being wounded, managed to shoot the attacker dead. As they waited for emergency responders to arrive, Czin used his tallit to stem Fares’ bleeding. The terrorist was a 57-year-old Jordanian national who had entered Israel several days earlier.